The DAE, under the Ministry of Agriculture in Bangladesh, has more than 25,000 workers in their department and is the largest ministry in the country. For more than 23 years, Dr. Mazharul Aziz has worked with the DAE to disseminate information and technologies developed at several national research institutes, directly to farmers at a grass root level. In his department, much of the work has traditionally been done manually. For instance, flood assessments, disaster assessments, land coverage and agricultural disease mapping were all analyzed and estimated without the help of Geographical Information Systems (GIS). Through a collaboration with the Asian Disaster Preparedness Centre (ADCP), UNITAR held a Geospatial Information Technology (GIT) for Disaster Risk Reduction (DDR) training for 10 ministries of the Bangladesh Government in Dhaka. The two-week training held at the Bangladesh Space Research and Remote Sensing Organization (SPARRSO) facilities allowed the 16 disaster management professionals participating in the course to learn how to use technologies that had not been used in the agriculture and other related sectors yet. He continued on to map the disease spread in order to show the actual disaster area and this work will help his department to prepare GIS map and find out actual effected area in future pest incidences. An effective planning of rehabilitation programme would be easier using GIS and RS technology. “It was hard to know the exact damage area from flood, drought or other disaster because they happened fairly frequently and all estimates were done manually. Now, with GIS we can show our department and ministry a clear picture of the area of disaster and others important information quickly”. Recently, the Ministry of Agriculture has been looking for funding for an e-agriculture project, and a meteorological project, both of which will use GIS, and Dr. Aziz hoped, “will have a direct impact on the farmers in Bangladesh.” These advisories and weather forecasts information will be distributed by the government through a portal, in the farmer’s language, at a grassroot level to 30,000 lead farmers and then indirectly to the country’s 3 million farmers. Dr. Aziz hopes UNITAR will be able to play a part in the proposed e-agriculture projects with e-learning programmes, the development of a GIS and RS lab and related training and GIS and remote sensing trainings. Bangladesh is currently self-sufficient for most of the cereals, however, they continue to import wheat and several other crops, Dr. Aziz believed that using GIS, they could be even better at crop zoning and learn to plant more effectively and efficiently to become entirely self-sufficient. 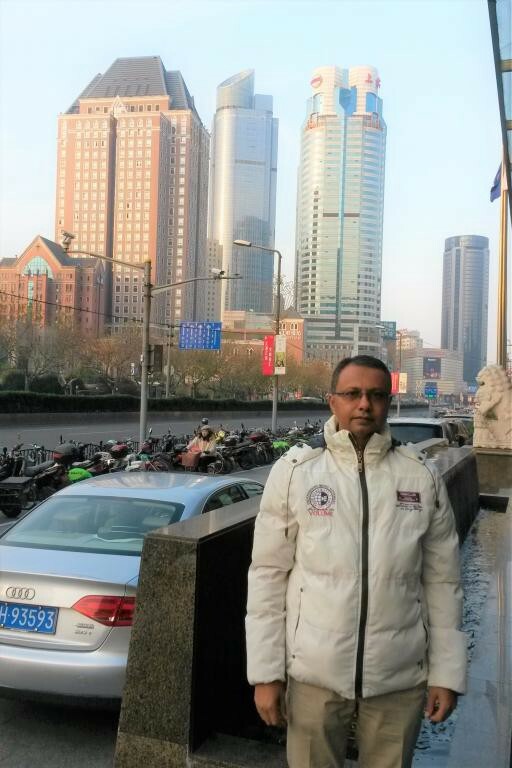 Picture: Dr. Aziz in Shanghai, China, where he attended a workshop (Multi Hazard Early Warning System), in December 2016.